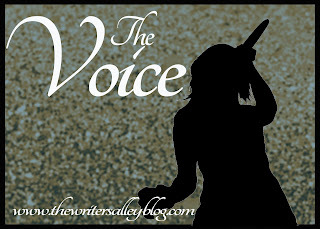 There was a point in my writing life, early on, that I despised any mention of the word VOICE. Agents and editors at conferences were all like, "We're just looking for that voice, you know?" No. No I don't know, is what I and MANY others wanted to reply. VOICE as it pertains to speaking we can kinda understand. It is the pitches, the rasp, the tone, the dialect, the lisps, all rolled together into a unique voice that is all that persons. Some voices, let's face it, are easier on the ears than others. It's why some people get voice-over gigs or acting gigs or are able to read for audio books. It's also why some people just---shouldn't. But unless it is an audio book (which rarely is the author's own anyway), how does voice play into books when you can't hear anything? Logical minds like mine want to know. Recently, I read a book. It was a really good book, I read it all the way through in like a day or two, which is rare for me these days due to time constraints. But I soaked it in and missed a LOT of sleep to finish it. A few days ago, I picked up another book. Same genre. Same very unique, historical time period. Different author. I'd heard RAVE reviews about the book and was really excited to read it. But I struggled through the first chapter. It wasn't bad. Actually, she is a brilliant author and the story seemed intriguing. The writer in me took a step back and compared the two. The difference between the two was VOICE. The first book was very jagged and sharp. The descriptions were vivid and held punch. It was fast paced and reminded me of a symphony playing a fast-paced piece with huge cymbals and crashes and clangs and loud crescendos and when done, the conductor turns around to take a bow, his hair all a mess from all the crazy playing. It wasn't the story that created this feeling, not all together anyway. It was the usage of words used by the author. The second book was soft. The descriptions were fluid and languid, beautiful and flowing. Instead of crashing cymbals there where soft dings of a triangle during a ballad that, while it might have gotten serious and faster at some points, the music never lost its softness. Again, it wasn't the story that was soft (it actually was a bit scary and rough at times!) it was the authors voice. Your voice is what makes your writing unique. It is neither good nor bad. However, the more your voice stands out in a crowd, the more likely it is to catch an eye of an agent, an editor or a reader. I honestly don't think so. Or at least, I don't think you SHOULD. You are who you are and its how God made you. And that is good. But just like you can go take voice lessens to strengthen your voice, to get your body used to hitting notes spot on, we can take our voice and hone it, add layers of harmony to it. I made this very poorly done visual because... I'm a visual person, so maybe it'll help someone else too! I showed, kinda like you would see on a sound graph, the two different writing styles I mentioned above. Both of them are unique and different. 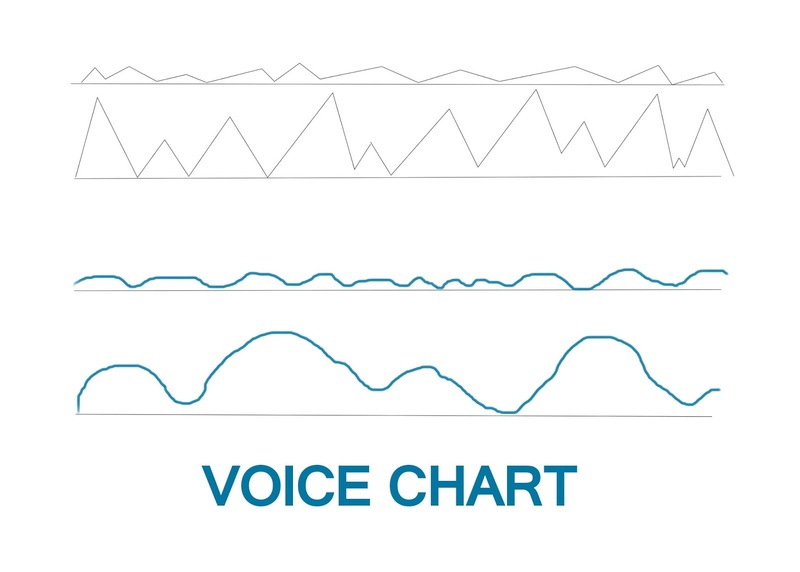 But both have normal versions of their voice, then toned, amplified, more recognizable versions of voice. 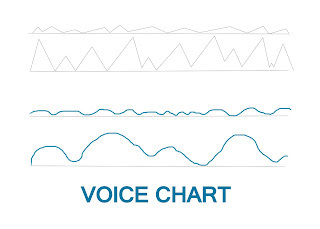 So how do you tone your voice, you ask? Just like in singing, I think PRACTICE is the number one key. Get professional HELP when needed. This might be a crit group or an editor or even just immersing yourself in some great writing books. I also think RECOGNIZING your voice is helpful. Are you an alto or soprano or bass? (I'm not really a singer... so I THINK those terms are right! ha!) Read other books in your genre, then after some distance from your own writing, read your book again. What tones do you hear that are similar and which ones are different? What makes yours stand out from the others? Does it stand out in a GOOD way or a BAD way? And okay. Some of you are thinking this right now and so am I so I'm just gonna throw it out there. What about the tone deaf? You know... the ones who sit behind you in church and screech their heart out but not even one note is on key and you think a dog just howled off in the distance somewhere? There will... be on occasion... some writers who are tone deaf. They love writing and putting words on paper and it looks and sounds majestic to them but everyone who reads it thinks -- oh dear. She blogs about finding JOY in the journey of LIFE at http://www.kristaphillips.com. She is represented by Sarah Freese of Wordserve Literary.